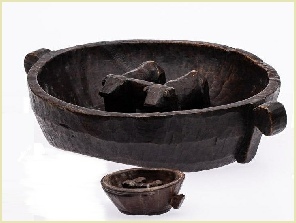 A pair of ceremonial wooden bowls from the Altiplano area of Bolivia. Nicely patinated. Each produced from a single piece of wood. Both contain a pair of yoked animals centered in the middle with side carved handle/straps. ca. 16th-18th century. Measures 15.5”/39.37 cm in dia. x 4”/10.16 cm H.; 4”/10.16 cm in dia. x 1.5”/3.81 cm H.
Note: There is an additional pottery bowl in this collection. Total of three pieces. Provenance: Greg Manning Galleries, New Jersey; Howard Rose, NY, consigned by the Metropolitan Museum of Art 1997.